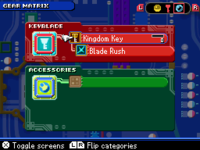 The Gear Matrix with the Kingdom Key and Blade Rush equipped. The Gear Matrix (デコレーションマトリックス, Dekorēshon Matorikkusu?, lit. "Decoration Matrix") handles Data-Sora's equipment in Kingdom Hearts Re:coded, including Keyblades, accessories, and Finish commands. In effect, the Gear Matrix determines how the Overclock system is implemented. Accessories are equipped in a similar fashion to the rest of the series, with each granting special bonuses, such as resistance to certain elements or stat boosts. More Accessory Slots can be acquired through progression on the Stat Matrix. As Sora successfully uses the Attack command and deck commands on enemies or certain objects, the clock gauge fills up. Each time the gauge fills completely, the clock level increases by one, activating an ability on the equipped Keyblade's unique Clock Ability Tree and moving on to the next tier. The abilities that will be activated on the tree can be selected on the touchscreen, or in the Gear Matrix. As a Keyblade chip levels up through use in battle, additional abilities will be unlocked on the tree. When an endpoint on the tree has been reached, filling the clock gauge again changes the Attack command to activate the equipped Finish command. The higher the clock level is when using the Finish command, the more powerful it is. Once the command has been used, the clock level returns to one, and all abilities on the tree from level 2 and on will deactivate. Oblivion A Keyblade that rewards wielders who share its hurt. Its powers will draw out your full potential. Defeat Data-Riku at Hollow Bastion I.
Oathkeeper A Keyblade that will guard you from many hurts. Its powers help accelerate your growth. Defeat Data-Roxas with a ★ rank. Only one Finish command can be equipped at a time. There are three types of Overclock Finishers: Simple Type Finish Commands are marked with a light blue symbol, Command Input Type with a red symbol, and D Magic Type with a purple symbol. Simple Type Finish commands are performed by pressing when prompted, and require no further interaction from the player. Command Input Finish Commands are performed by pressing when prompted, followed by pressing various buttons at specific times. D Magic Type Finish commands are performed by pressing when prompted, followed by using the D-Pad to aim, and tapping repeatedly. D Faiga?, lit. "D Figa") Use the D-Pad to quickly take aim and tap to repeatedly hammer foes with fireballs. Avatar Mode: Get all 99 Dalmatians from scratch cards. Spinner Ray (エイミングレイ, Eimingu Rei?, lit. Aiming Ray) automatically replaces the equipped Finish command chip when Goofy and Donald are both active party members during Hollow Bastion I. Accessories can be obtained by redeeming SP in various System Sectors or by completing various quests. The initial amount of accessories that can be equipped is one, but by hooking up chips to Accessory Expansions in the Stat Matrix, up to three additional slots can be unlocked, and as a result, up to four accessories can be equipped at any one time.